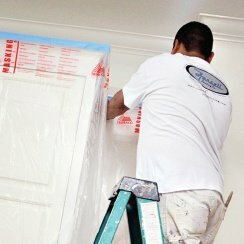 Our wide range of plastic masking products includes everything you need to cover, seal, and protect important surfaces during the painting process. 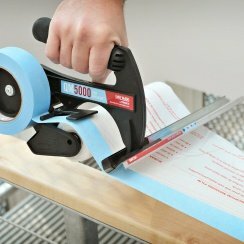 Trimaco’s pre-taped plastic masking film is a quick and easy surface protector. 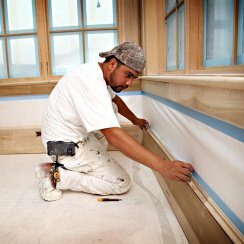 These products provide crisp, straight lines during the painting process. Our traditional plastic masking products include the self-adhering Cling Cover Sheeting, Standard and Premium Masking Film, and the Premium Trim Masking Plastic. 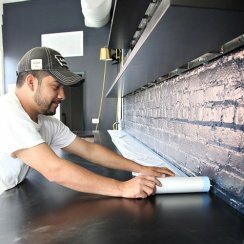 Treated film layers attract paint overspray with zero flaking, so clean up is even easier! Trimaco has everything you need to get the job done right. Our top-quality products are perfect for numerous paint and spray applications, and most maskers. Tape is pre-applied to one edge of masking film. 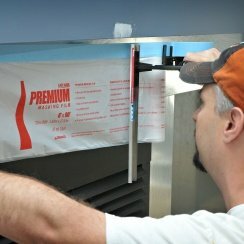 Plastic sheeting that clings and protects surfaces. Clings to almost any surface and attracts overspray. 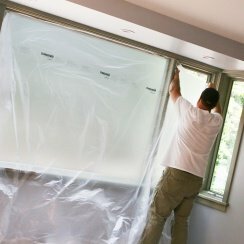 1mil plastic is clear to let light in and provides great bleed-through protection. Fast door protection from paint and more. Comes with everything you need to start masking all of your jobs. Helps make the masking process easier.